If you talk to a Ben & Jerry's fan, you might hear "I love Cherry Garcia" or "I love Chunkey Monkey!" Talk to a fan of Haagen-Dazs and you'll probably hear "I love the quality of Haagen-Dazs". All of these things are compliments of course, but talk to a fan of Graeter's and the response is always the same "This is the best ice cream on the planet". 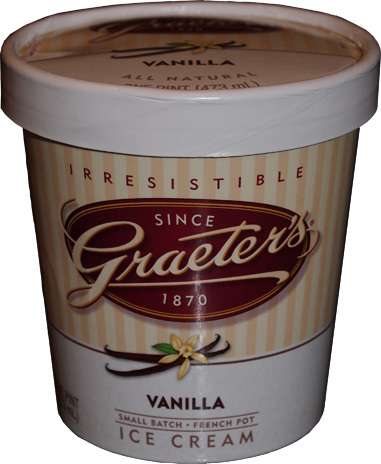 I've never seen anyone be rude about it, but people who grew up on Graeter's have set this stuff as the gold standard by which all others will strive to reach but never quite do. With such an established image, I was kind of shocked when I didn't fall instantly in love with Black Raspberry Chip or Chocolate Chocolate Chip. I never questioned the quality of the product, that would be silly, but I wasn't magically transported to another plain of existence.... until now. 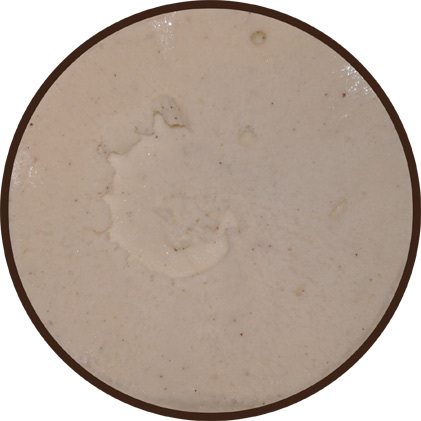 This is Graeter's Vanilla Ice Cream. That's right, just vanilla. A simple, unassuming, white-highlighted package with a little picture of vanilla beans on it. You see, I really wanted to give Graeter's one more chance, but I didn't want those pesky huge chunks of chocolate to get in the way again. Since there are only a half dozen flavors available here in central mass, my only non-chip choice was Vanilla. Look closely and you will see a wonderful off-white ice cream loaded with vanilla bean flecks. Man I hate when vanilla ice cream is white. White means fake. What you see here is the real deal. One word? Exquisite. Or Wonderful. Or Exceptional... fantastic, perfect, best ever... wait, that's two words. I know a lot of us have long since forgotten the days of plain ice cream, but you need to try this. I don't care if you haven't had vanilla ice cream since you were 7, you need to eat this and you will forever remember what real ice cream use to taste like. I can only attempt to describe how rich the vanilla flavor is here. It's unflippin' believably good. Look, you know about my unbelievably high standards and this one rocks them. I sat down with the final half of this pint and I didn't move until it was finished. It's that good. It's just a wonderfully complete vanilla that you need to eat with the smallest of bites. I was literally savoring every bite because it's just that good. This is how vanilla should taste and is a reminder of why I hate freezer aisles full of cheap vanillan flavored frozen dairy desserts. Have I won you over yet? I still can't believe how good this is. I had taken a few quick bites during the root beer float experiments but I didn't appreciate this one 'til I sat down in front of the tv with it. There is still a little bit of adjusting to the french pot process, but this is now the gold standard for vanilla flavor. Heck, diamond standard. The only drawback here is the crazy fat content. If you could get this flavor with half the fat, I'd just give up blogging and go back to eating this every night (j/k, I can't give up my mix-ins that easily). So, I now understand the Graeter's craze. I hope Market Basket and the others bring more non-chip flavors to my area. Now go get some! I love Graeters, I just wish I had more of a sweet tooth. All their stuff has mad sugar, and is cloyingly sweet to me. I have the same issue with Talenti. That said, this is a convincing review... I'll pick it up! you know, that's a good point. it may have been a "sweet" vanilla and may have been why it struck me are so superb. I think I need to buy another pint sooner rather than later. You could look far and wide and not find another vanilla with 30gs of sugar in a half cup. But hey Oprah declared it the best in the land, who am I to argue? It went on sale $3.99 a pint yesterday, I should obtain right away! Graeter's is local to me, so I'm glad to see such a glowing review! I can't believe you thought the chips got in the way, though. I think I'd been eating Graeter's for ten years before I tried a non-chip flavor. so you get go to the scoop shops? Out of curiosity, are the chips as big as they are in the pints? Nice! I've never seen that before, it helps explain the huge fan base! I would like to see how Talenti's Tahitian Vanilla Bean Gelato compares to this because I heard that Talenti's Tahitian Vanilla Bean has has a very strong vanilla flavor and I would like to know if it's worth the price. Maybe you can consider reviewing it sometime! agreed & actually that one is on my to do list! Awesome! Thanks for taking it into consideration! Where in central Mass do you get Graeter's from? I loved it from many visits to Ohio, but have always been resigned to doing without when I'm in Boston. are you literally in the Boston Area? There are a couple of Market Baskets near you as well a bunch of whole foods which are now carrying it as well. Price chopper has them but they are further west. Whole Foods near MGH does too!